This is the ‘Greatest Depression’! Following the Fed’s somewhat downbeat perspective on growth, confidence in investors’ minds that the US can decouple has been temporarily jilted back to reality. It is of course no surprise and as the World Bank points out half of the world’s approximately $15 trillion trade in goods and services involves Europe. So the next time some talking head uses the word decoupling (ignoring 8.5 sigma Dallas Fed prints for the statistical folly that they are), perhaps pointing them to the facts of explicit (US-Europe) and implicit (Europe-Asia-US) trade flow impact of a deepening European recession/depression will reign in their exuberance. An increasingly vigorous flow of goods, services, and finance over the last five decades has fueled European growth. Europe’s economies are the most open in the world. 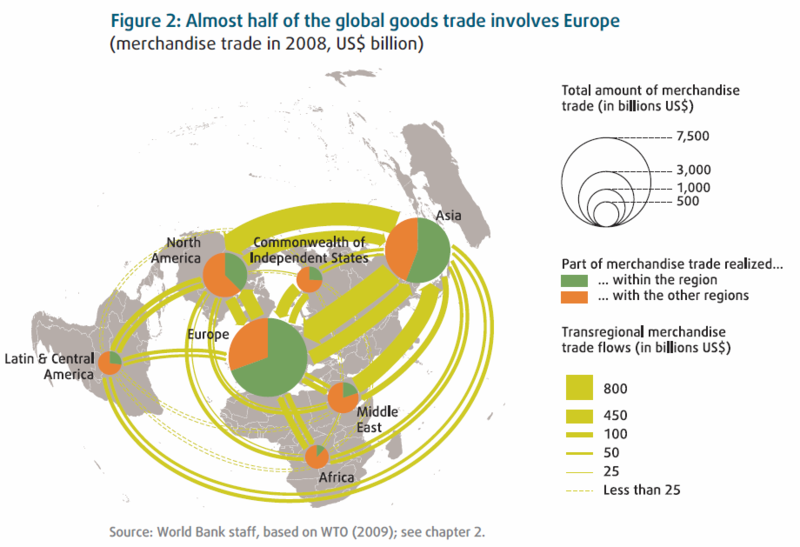 Before the global crisis of 2008–09, half of the world’s approximately $15 trillion trade in goods and services involved Europe (figure 2). Two-thirds of it was among the 45 countries discussed in this report. Financial flows have been equally vigorous. In 2007, for example, annual FDI in Europe exceeded $1 trillion. Big and growing trade and financial links facilitated by the single market form the core of the European convergence machine.